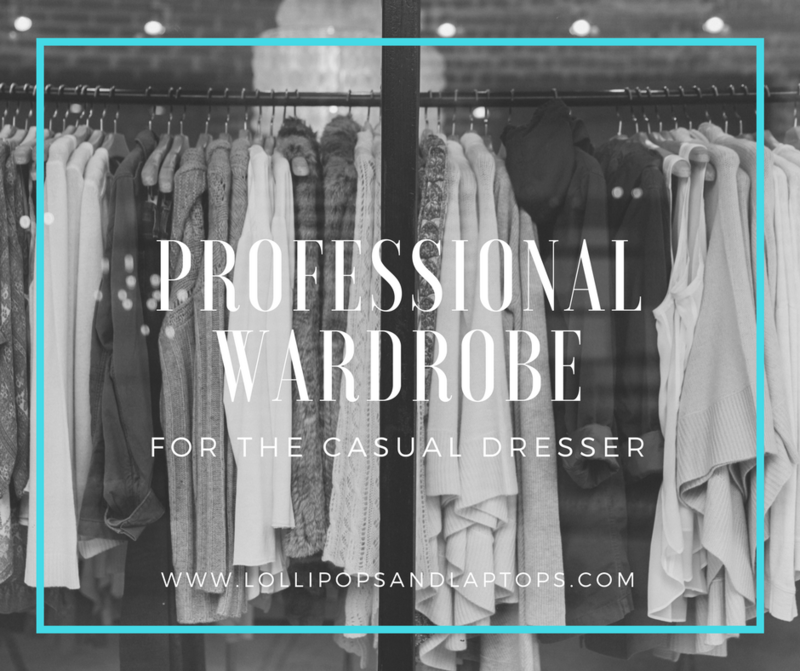 In its most basic sense, I go with a neutral capsule wardrobe. Over time you can build on the pieces and add additional color and dimension. But the pieces I invest in most are always black, white, beige, navy, and gray. A Do-It-All Combo Suit: I’m all about efficiency when it comes to making purchases for the office wardrobe. 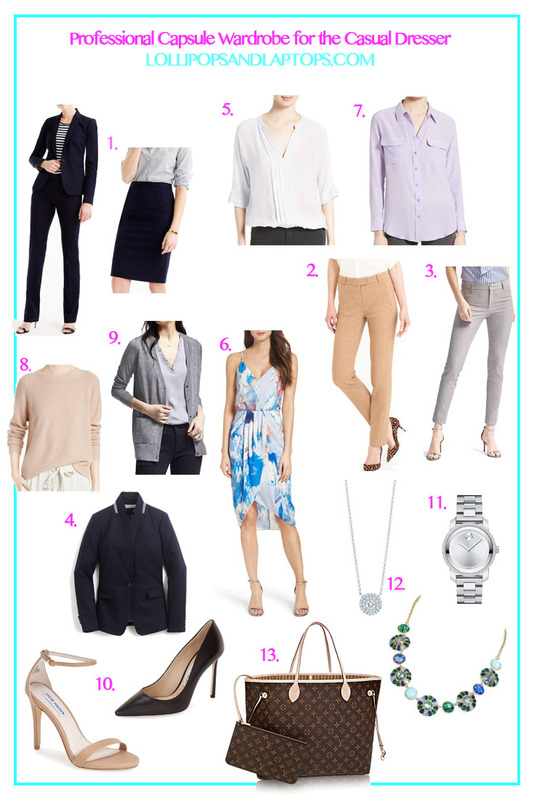 Choose a blazer, pants, and skirt combo in the same color and fabric, particularly a soft and/or stretchy fabric. These pieces aren’t super pricey, are lightweight options that work year-around, and are relatively good quality. Light(er) Pants: With little kids, this one’s a crapshoot unless I’m sure to be out of the house before they’re in the kitchen in the morning. Even then, there’s no guarantee that I won’t spill my chai tea latte or my lunch on them, but a lighter neutral is essential to balance out all the black and navy tops I own. Gray Pants: I tend to go black for the suit combo and then have gray and/or navy suit separates. My go-to option is a year-around, slim-fitting silhouette that hits just above the ankle, which looks great with pumps or booties. I’m not exaggerating when I say I have this pair in five different colors. A Well-Tailored Blazer: Of all the pieces in my closet, I probably have the most blazers. They dress up any outfit, and since I run cold, I can wear them over a dress in the warmer months to keep from freezing in the office. A Classic Blouse: I love, love this blouse. I have it in two colors and I’ve had them for years. I wear them regularly to work and even with jeans on weekends. They are super lightweight and the fit is so cute. It’s a classic style that has proven more than worth its investment. A Colorful/Patterned Dress: Most of my dresses fit in the black/gray/navy neutral category, but I love a good colorful or patterned dress. Since I wear them less often because they’re more memorable, I try not to spend too much on these pieces. Make it office appropriate with that fitted blazer over it. A Colorful Blouse: Same idea as the dress, though I find a solid colored blouse in a classic fit can be worn a little more often, especially when mixed with different bottoms and a blazer or cardigan on top. I love this brand because of the excellent quality and nice fit. Sweater: I wear sweaters religiously in the winter. Look for one that’s good quality (I love cashmere), and has a fit that can work both with work clothes and jeans. Cardigan: Second to my blazer collection, I love a good cardigan, and I own them in so many different colors. They’re great for the really hot days when a blazer is just too warm, and I love how I feel a little more casual and less stiff in them. Black and Neutral Heels: I mostly go for a classic pump, but my current job allows a little flexibility, so if yours does, an open-toe sandal is a nice option that feels a little less formal. A great watch: For an investment that says “serious corporate badass,” my choice is a timeless timepiece. This should be purchased in whichever metal color you wear the most. Classic and Trendy Necklace: Having a tried-and-true classic necklace (this one was my wedding gift from my husband) is imperative to those of us that aren’t heavy on the accessories. Still, I’ll grab a trendier item here and there when I know I’ll wear it. I just won’t spend as much on it. A Wear-With-Everything Purse. Before I had kids, I was quite the purse collector. Sadly, they’re all sitting in their dust jackets in the closet… collecting dust. Now I want one carryall that can pull double duty when I’m not carrying my diaper bag but is sophisticated enough to bring to work every day. The coated canvas material on this has proven insanely durable. It even survived me spilling an ENTIRE BEER into it (true story… sober… I talk with my hands a lot). A great way to keep your pieces timeless is to get them tailored to get the fit of a more custom piece. It’s worth an extra $50-$100 if it’s going to look fantastic for the long haul. With any luck, my industry will get with the times and head toward real casual wear, but in the meantime, I’m continuing to hone my professional look in a timeless but casual-ish way. After all, isn’t it easier to climb the corporate ladder when you’re wearing comfortable clothes?